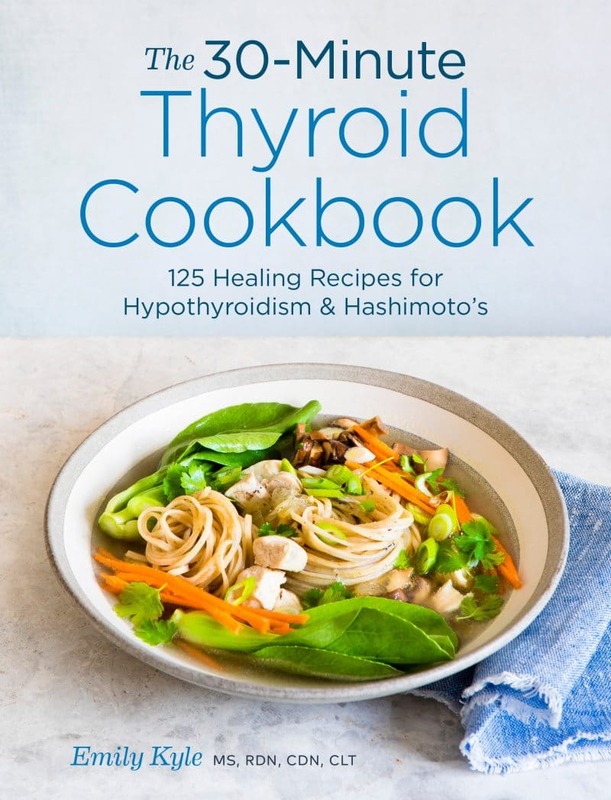 Learn more about the autoimmune thyroid condition Hashimoto’s, and hypothyroidism, and How Women are Affected and What You Need to Know, plus learn more about how The 30-Minute Thyroid Cookbook: 125 Healing Recipes for Hypothyroidism and Hashimoto’s can help you to restore your good health. Note: This post was written in help of my intern Sarah Gellar, Dietetic Intern. 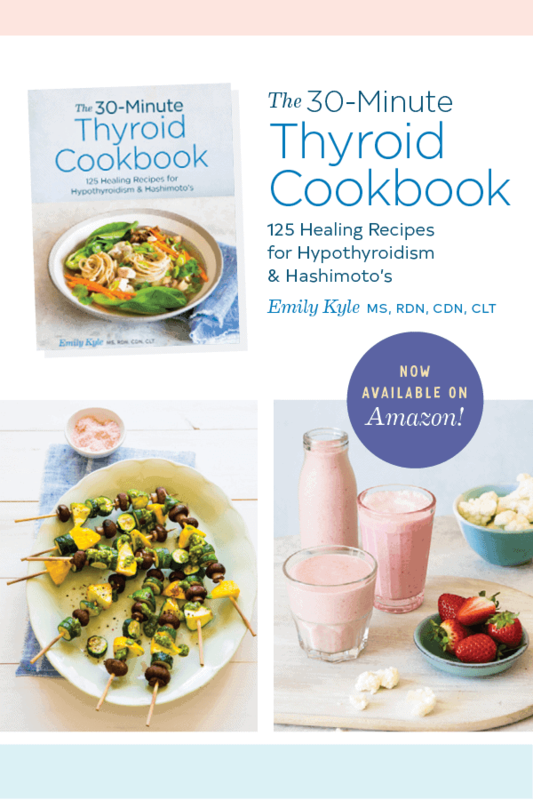 Hashimoto’s disease, or Hashimoto’s thyroiditis, is classified as an autoimmune disorder that often causes hypothyroidism, also known as an underactive thyroid. The thyroid functions as a hormone-regulator, affecting many organs within the body. When the thyroid is underactive, not enough hormones are being released, leading to problems beyond the thyroid. How do you know if you have Hashimoto’s or hypothyroidism? There are a variety of signs and symptoms linked to Hashimoto’s, however, there are often no evident symptoms at first. Before being diagnosed, the thyroid typically gets larger. The enlarged thyroid is called a goiter. Symptoms of hypothyroidism, which is associated with Hashimoto’s, include tiredness, weight gain, joint and muscle pain, constipation, dry and thinning hair, and heavy or irregular menstrual periods. Hypothyroidism (Underactive Thyroid) occurs when the thyroid gland is not producing a sufficient level of thyroxine (T4) and triiodothyronine (T3). If you are concerned that your signs and symptoms may be due to the development of Hashimoto’s thyroiditis, there are many options available today to help get you a definitive diagnosis. You can start by going to your doctors office and sharing with them your symptoms and concerns to see if they feel it is necessary to run a thyroid panel. Thanks to advancement in medical technology, you can also order your own thyroid panel, allowing you to bypass the doctors office all together. I am proud to work with a personal home testing platform called LetsGetChecked. LetsGetChecked is a diagnostics platform linking customers to laboratories for personal health testing and subsequently providing actionable information and robust clinical pathways for customers in need of treatment and care. LetsGetChecked customers can order tests online or attend participating pharmacies to get checked within a dedicated consultation suite. I was lucky enough to chat with LetsGetChecked and to share my thoughts on how chronic illness management can be linked back to what we are putting in our bodies. The inclusion of certain foods in your diet will not cure your thyroid condition, however, alongside other positive lifestyle changes and medication there are a number of nutrients that can radically help to balance your thyroid hormones and improve your symptoms. Hashimoto’s is seen in around 5 out of 100 people and it is the most common reason why people experience hypothyroidism. In the U.S., over 14 million people have been diagnosed with Hashimoto’s. Women are more likely (about 8x to be exact!) to have Hashimoto’s than men. The disease is more prevalent for women between the ages of 40 and 60. Studies have found that genetic factors contribute to a person’s likelihood of developing the condition, in addition to environmental factors and other autoimmune disorders. More recent studies have looked into nutrition as a factor in the development of Hashimoto’s. While there is still a lot of research being done on nutrition and Hashimoto’s, researchers have found evidence that certain micronutrient levels play a role in the disease. High iodine intake and deficiencies in selenium, iron, and vitamin D have been linked to Hashimoto’s. 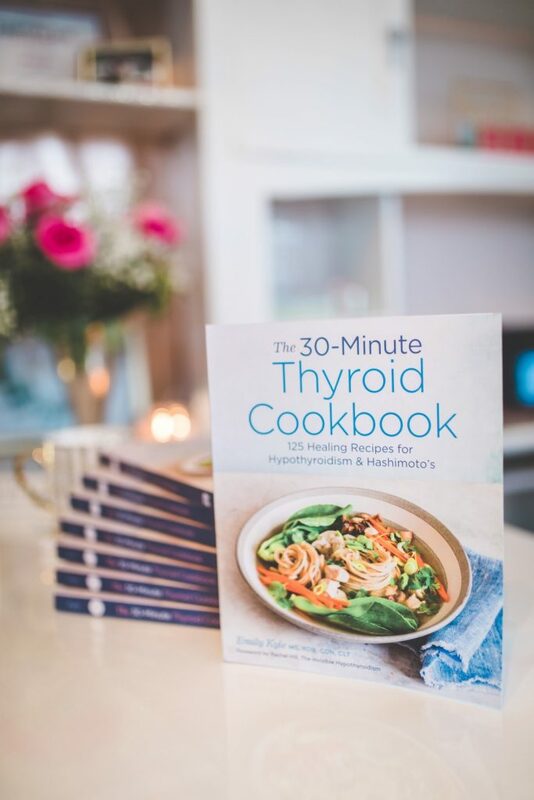 Diet can also help in the treatment of Hashimoto’s disease, which is why I wrote the book: The 30-Minute Thyroid Cookbook: 125 Healing Recipes for Hypothyroidism and Hashimoto’s which is available to order now. Iodine intake is very tricky for people Hashimoto’s because individuals should take in less iodine, but it is also important to ensure you are consuming enough. The main food sources of iodine are seafoods (seaweed, scallops, shrimp, salmon, and tuna), animal products (yogurt, milk, eggs), and fruits like cranberries and strawberries. You should also watch out for iodized salt, which is a major source of iodine. People with Hashimoto’s can benefit from adding more selenium to their diet. Selenium is found in soil and gets passed on to plants. Foods high in selenium are Brazil nuts, oysters, tuna, whole-wheat bread, sunflower seeds, meats, and mushrooms. People with Hashimoto’s are encouraged to increase their intake of vitamin D. Vitamin D is a fat-soluble vitamin that supports the body’s absorption of calcium. The easiest way to get vitamin D is to step outside into the sunshine! However, those of us that live in places with cold, dark winters need to find other ways to get our vitamin D. Food sources of vitamin D are fish (cod liver oil, wild salmon, sardines) and dairy products. There is not clear evidence that a gluten free diet can prevent autoimmune diseases, such as Hashimoto’s. Yet, a connection has been found between Hashimoto’s and Celiac disease (an autoimmune disorder where the intake of gluten damages the small intestine). Due to this finding, people with Hashimoto’s are advised to follow a gluten-free diet as a part of treatment, along with getting tested for Celiac disease. Gluten is found in wheat, barley, rye, and oats that are not certified gluten free. These grains are often in breads, pasta, cereals, and baked goods to name a few. Be sure to look for gluten free certification, especially if you are diagnosed with Celiac disease, or a gluten free label on packaging at the grocery store. Additionally, foods high in phytonutrients, quality fats, and probiotics are all beneficial to people with Hashimoto’s. An overall nutritious diet full of fruits, veggies, healthy fats, and whole grains can benefit everyone, especially those with an autoimmune disorder. While diet can help increase or decrease your intake of micronutrients, some patients may benefit from additional supplementation as part of an individualized treatment plan when working with their registered dietitian. The prevention and treatment of different diseases includes a nutritional approach more and more these days. The management of Hashimoto’s and Hypothyroidism is best when approached in a whole holistic lifestyle way. People are becoming more proactive and the medical field is catching up to the philosophy that medical problems should be prevented rather than treated. Medicine is becoming less reactive, and we have discovered that prescribing medications to treat a problem is not a long-term solution. For those who are diagnosed with Hashimoto’s or any other autoimmune disorder, diet can make a difference and help to treat a disorder and therefore, relieve symptoms. 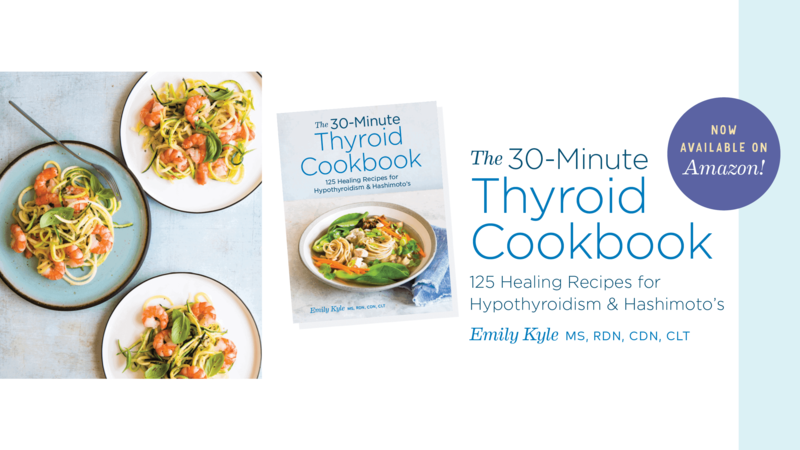 That is where the importance of The 30-Minute Thyroid Cookbook: 125 Healing Recipes for Hypothyroidism and Hashimoto’s comes in. You are so welcome, I’m so glad it was a good refresher for you! I can’t wait until you get it! Thank you so much, I hope they find it helpful! I am so sorry to hear that, Lorie, but I hope she finds this helpful!! Anything you need, just let me know! My mom was recently diagnosed with Hashimotos. She is sooooo excited for this resource!! This post was so informative! I can’t wait until your book is released and I get my hands on it! This was very insightful- I’m so glad you’ve created resources to help women manage their Hashimoto’s! I love how you mention that food is medicine! It is so important to incorporate foods that will heal the body and fuel it with the nutrients it needs to help fight hashimotos disease and decrease potential symptoms! Need to get my hands on this book!! This was such a good brush up on a topic I learned about in grad school. So interesting. Thanks for sharing!